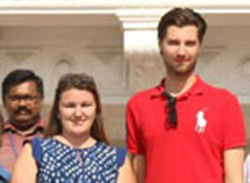 Trolle and Victoria from Umeå University, Sweden share their Campus Exchange Experience at SRM Institute of Science and Technology (formerly known as SRM University), Kattankulathur. “We are two students here on a student exchange program from Umeå University in Sweden. We came here for experiencing the Indian culture and traditions. For us the time here at SRM Institute of Science and Technology (formerly known as SRM University) has been challenging but also very exciting. The first couple of days we had to adjust to the climate, the food and the campus area which took some time. However, after a couple of weeks with a lot of help from others we settled in very nicely. Our faculty has specialized our courses and adjusted them to our needs. That made the transition between the Swedish and the Indian school system easier. All our teachers have been very involved and helpful for us to absorb as much knowledge as possible. We believe that the additional knowledge we gathered here at SRM will eventually help us in our working life.